QT-ESL 07 "To want someone to do something"
This podcast will help you to practice the expression "To Want Someone to Do Something" in oral drills. I hope it will make you progress and that you will enjoy it. We now have PDF files with scripts for mobile devices that you can download directly onto tablets or smartphones. There are also Zip files for teachers with scripts and worksheets in PDF and DOC formats. Visit our store for more information. 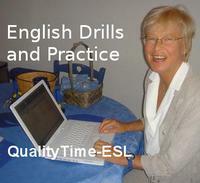 To see samples of the files for mobile devices and the Zip files go to QualityTime-ESL Podcast No. 1. Open the Zip file with 7-zip software free from 7-zip.org. QT-ESL 7 "To Want Someone to Do Something"